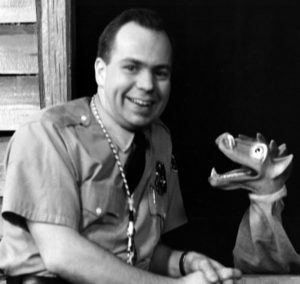 Don Kennedy (aka Officer Don) with puppet Orvil. Don Kennedy’s passion for Swing Era music translated into 25 years of producing and hosting the nationally syndicated radio program Big Band Jump. In addition to scripts and cue sheets, the collection contains broadcast master recordings of more than 600 episodes. These are accompanied by recorded, unedited interviews with popular and big band musicians such as Tommy Dorsey, Jo Stafford, Henry Mancini, and Sy Oliver. 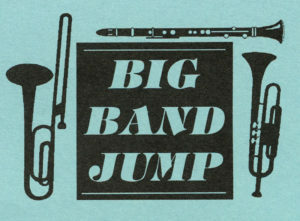 More from the Don Kennedy papers can be found in the Digital Collections, including complete issues of the Big Band Jump Newsletter, photographs, and an oral history interview with Don Kennedy. This entry was posted in Digital Collections, For Faculty, For Graduate Students, For Students, General News, Music, New Resources, Oral Histories, Primary Resources, Resources, Special Collections & Archives. Bookmark the permalink.